"Arts and Poetry, Being Thoughts towards Nature. Conducted principally by Artists." William Michael Rossetti, ed. The Germ . No. 3. (March 1850). London: Dickinson & Co. and Aylott & Jones. Accessed online by permission of the British Library. Rossetti Archive Textual Transcription. 16 Dec. 2006. .
Hough, Graham. The Last Romantics . London: Gerald Duckworth & Co., Ltd., 1949. Litzenberg, Karl. "William Morris and the Reviews. A Study in the Fame of the Poet" The Review of English Studies . Vol. 12, No. 48 (Oct., 1936), pp. 413-428. JSTOR. Accessed from Brown University. Mathews, Richard. Fantasy: The Liberation of Imagination . Studies in Literary Themes and Genres No. 16. New York: Twayne Publishers, 1997. Morris, William. The Water of the Wondrous Isles. New York: Ballantine Books, 1971. _____. "Golden Wings" The Defense of Guenevere, The Life and Death of Jason, and Other Poems . London: Oxford University Press, 1914. pp. 124-31. Accessed online at VictorianWeb.org. 17 Dec. 2006. Rabkin, Eric S. The Fantastic in Literature . Princeton, New Jersey: Princeton University Press, 1976. Ruskin, John. "Fairy Land" from The Art of England: Lectures given in Oxford. Sunnyside, Orpington, Kent: George Allen, 1884. Wood, Christopher. The Pre-Raphaelites . London: Seven Dials, Cassell & Co., 2000. Although Pre-Raphaelitism confessed a dedication to the natural world and reality, the subjects and themes of many Pre-Raphaelite works indicate a continued fascination with the medieval past. The short-lived Pre-Raphaelite Brotherhood opposed what they conceived of as the 'trivialities' of the academic art establishment and aimed to create a moral, truthful art (Wood 10). As the name suggests, the Pre-Raphaelite goal was to return to the historic past in order to create a new modern art. In effect, by returning to Northern Renaissance and Medieval art, the Pre-Raphaelites sought to recreate art history through revitalizing an art-that-never-was. The Pre-Raphaelites were essentially interested in establishing a moral truthfulness in art and literature. In aspiring to a photographic realism and fidelity to nature in both painting and poetry, the Pre-Raphaelites embraced Ruskin's advice to "go to nature in all singleness of heart... rejecting nothing, selecting nothing and scorning nothing; believing all things to be right and good, and rejoicing always in the truth." (Wood 10). The Pre-Raphaelites believed that by representing nature as realistically as possible, they could create a moral beauty and truer art. At the same time, this adherence to every natural detail borders on the unreal; the human eye is unable to conceive of every fact and detail, the human brain unable to process this wealth of information. Ruskin attacks precisely this inability of his contemporaries to embrace all the real truths and moral beauty in Modern Painters (Hough 9), which was read by and influenced nearly all the founding Pre-Raphaelites. Here, at the edges of a heightened realism exists the realm of fantasy. The project of fantasy remains closely related to the boundaries of conventional reality. The fantastical should, and does, elicit wonder by means of elements of the supernatural or the impossible (Mathews 2). However, in order to apprehend impossibility, one must first understand the boundaries of the possible. In his study on fantasy, Eric S. Rabkin contends that only after the ground rules of reality have been established can the fantastic be achieved (4). The fantastic is, in actual fact, merely a step away from reality and exists in this distance from reality. Indeed, the later Pre-Raphaelites reconciled their quest to represent realistic nature and moral realism in a fantastical romanticism. Thus while the members of the PRB such as Millais painted highly realistic and historically accurate scenes that drew from biblical or at most Shakespearean subjects, the aesthetics of the later movement looked to chivalric themes and Arthurian tales. From paintings such as Hunt's The Lady of Shalott to Millais's Ophelia, the heightened color palette, sharp lines and medieval garb of the ladies indicate an interest in the historical past that exemplifies the fascination in pseudo-medievalized semi-mythological worlds explored by other Pre-Raphaelites and their followers. 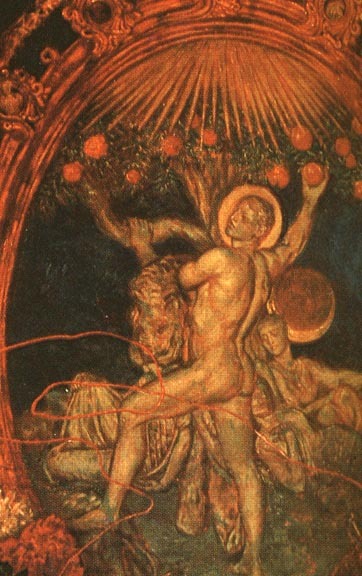 In his study on literary fantasy, Rabkin argues that the roots of this widespread Pre-Raphaelite fascination with the medieval lay in the movement's attempt to "reverse history" and to "restore 'Nature' to English painting ... [through a] romanticized medieval style that they saw as recalling the harmonious age before the Renaissance emergence of Raphael." (199). The almost obsessive detail and rich colors of these works create fantastical beauty and indicate sublime meaning. 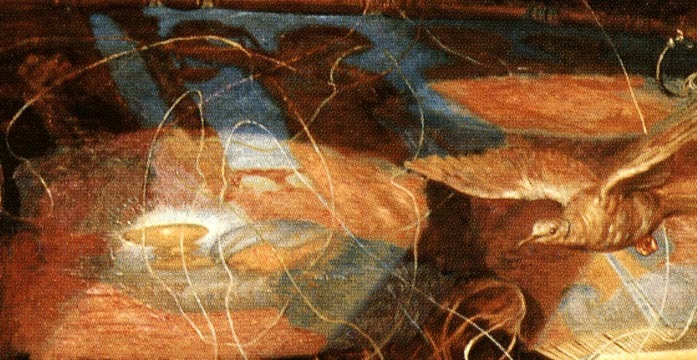 For instance, in The Lady of Shalott , Hunt directs the viewer's gaze to the cracked mirror behind the cursed lady. A frieze on the right hand side of this mirror shows the infant Christ with the Virgin and opposes the opposite mural of Hercules completing the Eleventh labor in the act of stealing the golden apples of the Hesperides. These paired images of Christian and pagan salvation add a deeper morality to the doomed Arthurian tableaux in the foreground. By means of the creation of a heightened reality and natural symbolism, the Pre-Raphaelites aimed to engage the modern imagination and consciousness.